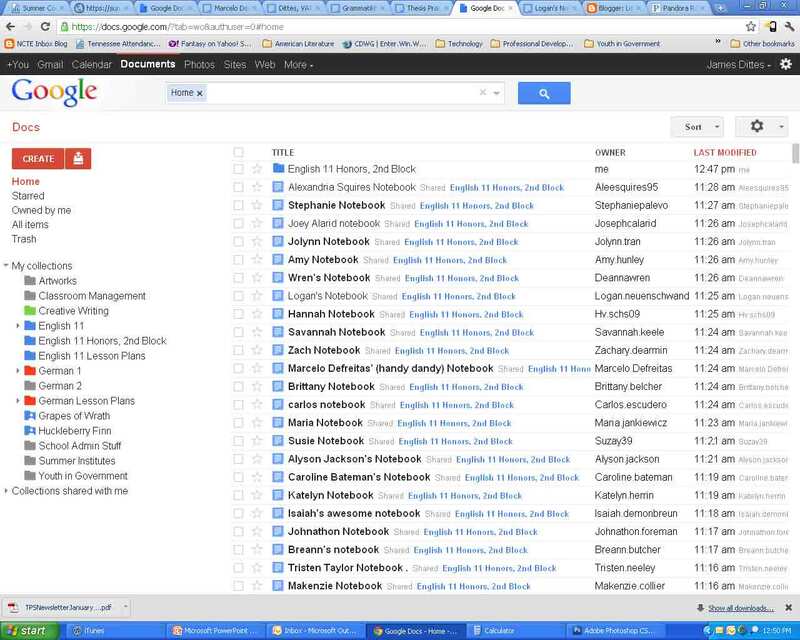 Today (the 2nd day of the class) was the introduction to Google Docs in my Honors English 11 classes. I always love this day. 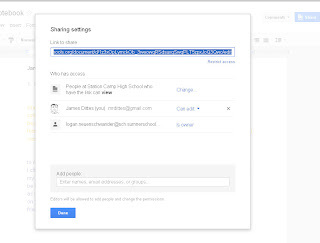 The features like real-time sharing never fail to elicit "wows" from students, and it's important that they get a strong understanding of how to login. In my English classes students submit most of their written work on Google Docs, and I also grade it online. 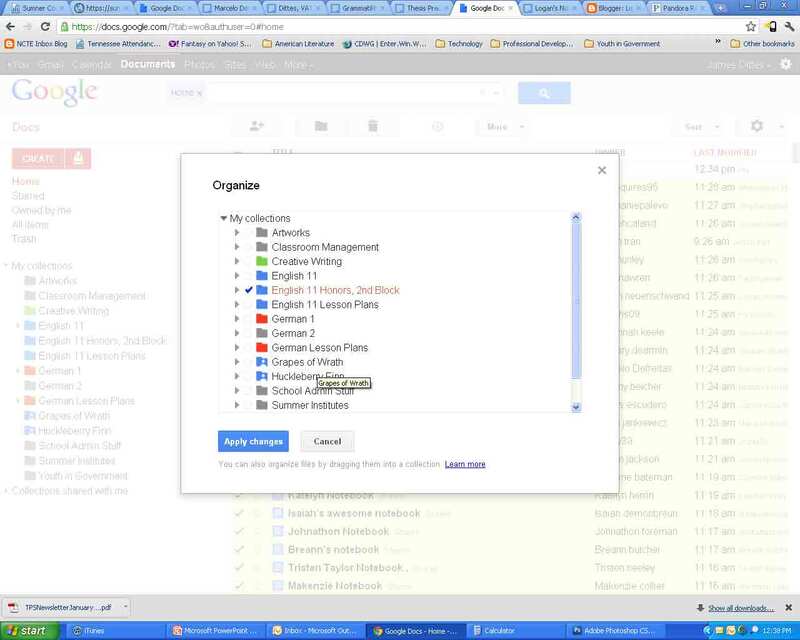 When I began teaching with Google Docs, organization was the biggest challenge that I faced. 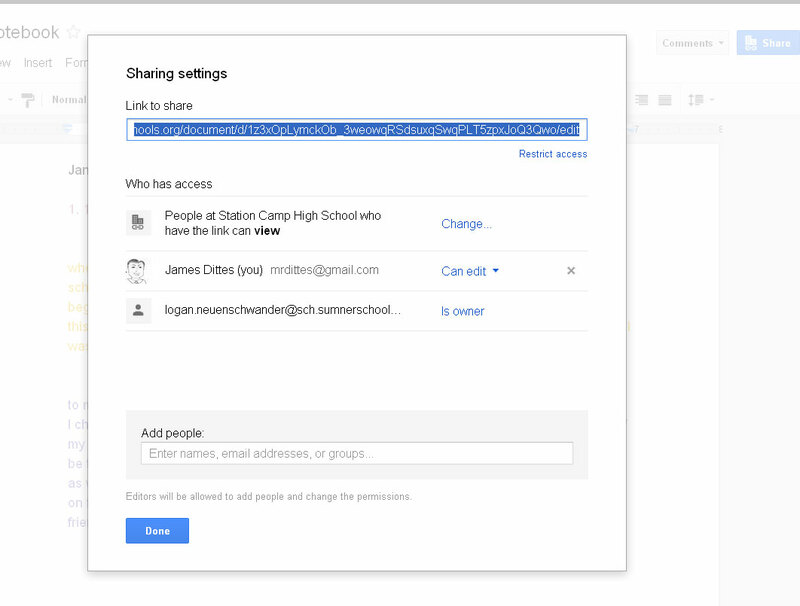 I want to use this blog to show the way I introduced Google Docs. 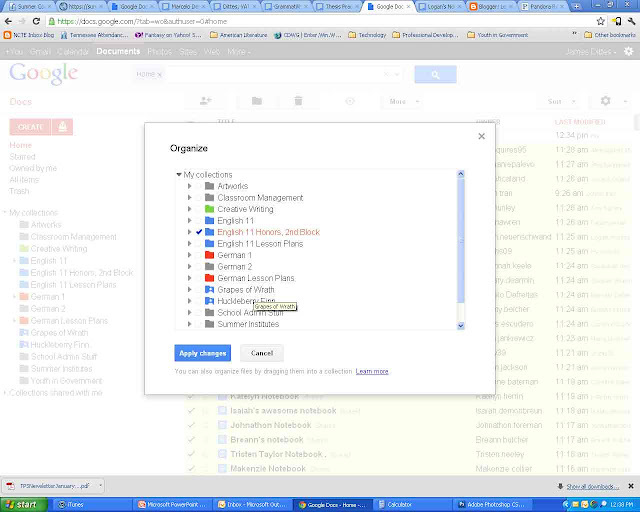 A key step on the first day of Google Docs is getting everyone on the same page. 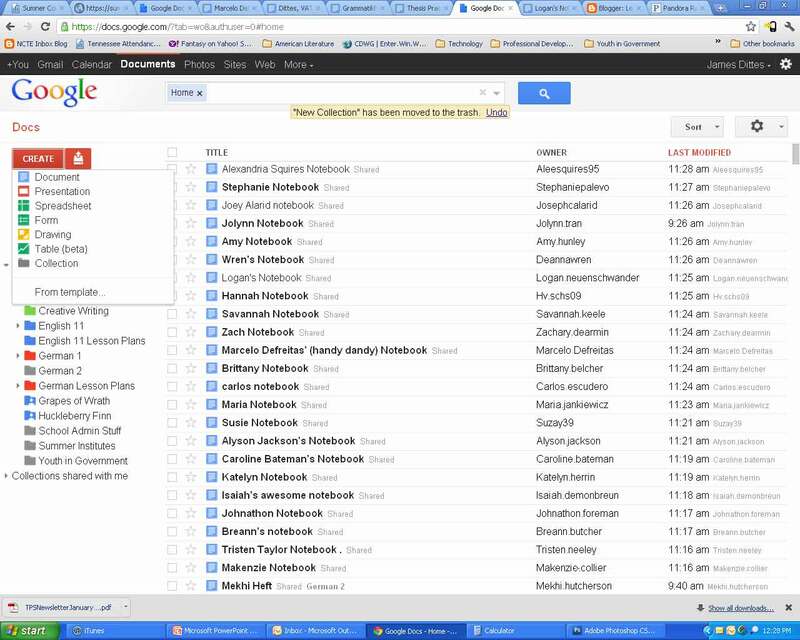 I noticed that most students had Google or GoogleApps accounts, but those that didn't needed to be quickly brought up to speed. I set up a new GoogleApps account for one students who had no account. Other students had to negotiate security hurdles that blocked them from Google Docs (I usually blame the browser for blocking security access to Google Docs--Internet Explorer and Firefox are frustrating, and I have tried to install Chrome on all of my classroom computers). Today I noticed that our local network security was the problem, and I headed it off by routing through a different, wireless router. The first step for any Google Doc is the title. I call the "daily doc" a Notebook, where I expect students to input their daily work. I made sure that all titles had the student's name included, which would make grading easier. I noticed that one student had entitled his work, "Marcelo's (handy dandy) Notebook." Good for him! Glad to see someone is already having fun. Once students had shared their pages, the "administrative" work is done. I will be able to see all future updates (in real time, no less). Their future challenges--besides keeping up with the daily work--will be managing logins, overcoming gaps in wireless service, and keeping the computers working. On the Back End, that leaves me with a Docs file that looks like the picture. I have two dozen new shared documents for each class. It's very easy to lose track of these documents as others are added or updated. That's why it's important for me to find a way to keep each class's documents in one manageable place. For this, I create a new Collection. I give the collection the title of the class that I manage/teach--in this case "English 11 Honors, 2nd Block." I will now be able to have all students' notebooks in this folder. As an added bonus, I make all of my English-related folders blue. It helps to distinguish them from the German and Creative Writing classes that I teach. Next I select all the documents shared with me by the 2nd block class. I select the folder icon at the top of the document list, and select "English 11 Honors" as the destination folder (see picture below). Now I'm ready to manage--even if I may not feel so ready to grade! I have the class's papers together, and I can efficiently keep up with the work my students are doing--at least on Google Docs. 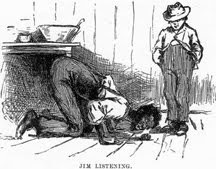 A myriad of other online projects: Sites and blogs, to name two, are waiting for me to review and grade. If only organizing my non-Docs projects were as easy as this. It is a good rule of thumb to be sure that all documents on your home screen are organized into one collection or another. This makes it easier to find stray assignments, presentations and lessons. In the final result (shown below), the blue-colored Collection Name is part of the master list, too, making the notebooks from all my classes very easy to access.